Dr. Shelby with her patient and medical tools laid out in her office, ready to perform a life-saving procedure. Said patient, after his head transplant, feeling much better. Shelby is currently a vet. She has been some form of this for quite a while. She has always been an animal LUVER. But her passion changes from horses, to sea creatures, to dinosaurs, to cats and dogs. Right now she is a vet to cats and dogs, and all things stuffed in our home. She gives them tender-loving-care, along with a hefty dose of athletic tape and neosporin. 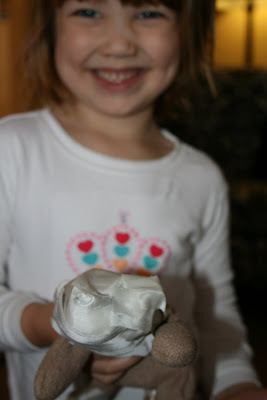 I had to enforce the "pretend neosporin rule" after a few of her animals were getting a little goopy. 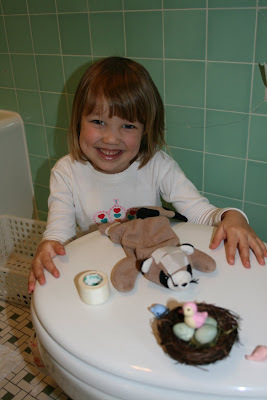 She and her BFF Hannah have been hard at work in their "office" aka: the kid's bathroom. They give "shots" with the medicine droppers, and even brush the animal's teeth. After they have finished "operating" they bring the animals out to me where I gush over how happy I am to have my pet back and thank Doctor "Kristen" and Doctor (crud, can't remember Shelby's pretend vet name) something-or-other for their good work. "Is she going to be OK?" I say in a panicky voice. "Oh yes," they say reassuringly. Then they return to the stuffed animal bin to save another patient. How I love my "vet".